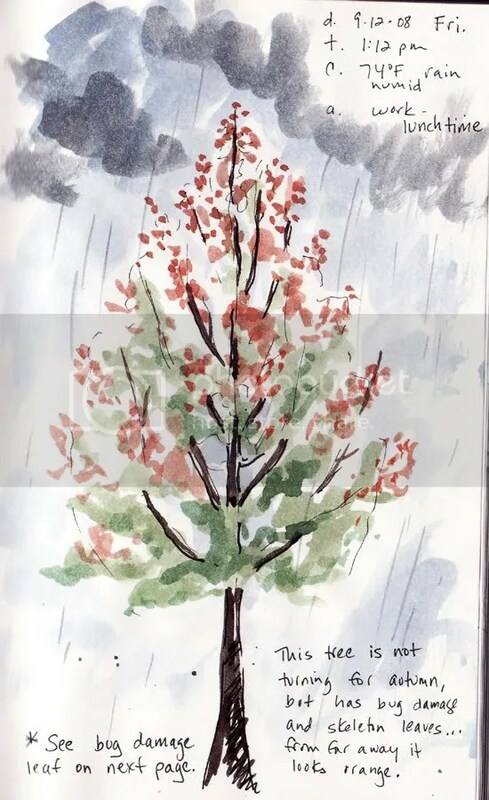 Relentless Rain – Let's Paint Nature! Chicago is sitting in the middle of a wet pattern. It has been raining for 2 straight days and no end in sight for at least another 24 hours. Remnants of Hurricane Ike that hit Texas a few days ago is pushing humid, rainy weather up our way. I’m not complaining because 3 days of rain is nothing compared to what the people of Texas had to face as a full force hurricane. My prayers are with them. Will a little rain stop our painting? OF COURSE NOT! Some of your best work can be accomplished during adverse weather. Let the limited sunlight and gloomy colors challenge you to reach a better level as an artist. Here is a sketch I did Friday of a tree outside my work. I was on my lunch, so I only had 30 minutes to complete. For this sketch I had my travel Winsor and Newton watercolor kit, black micron pens, and my hard cover sketchbook. For my technique, I like to draw the subject first with the micron pen and then add watercolors later. You can do it any way you wish. Here is the work of a very bad beetle. 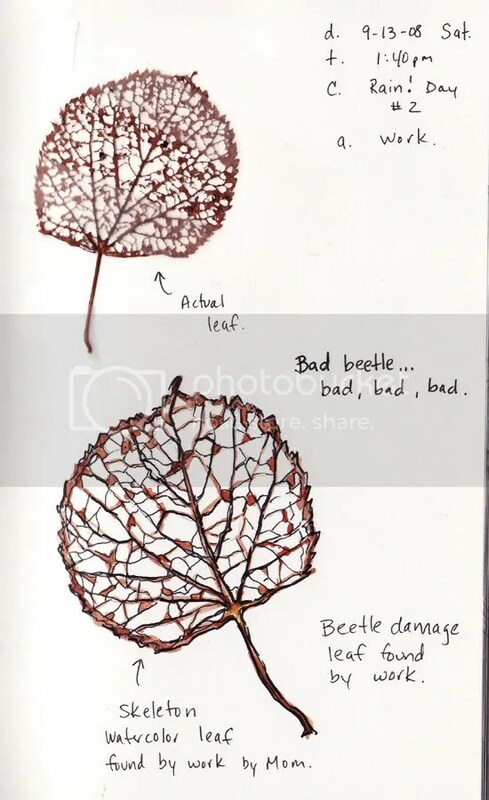 The top is an actual leaf I taped in my sketchbook and the bottom is a slightly larger watercolor version. Fascinatingly beautiful but devastatingly destructive. I eally appreciate seeing the artistic work that people do while doing their day jobs. I think this is why blogging is so important. It motivates us to improve our skills and share it with others. Thanks for this beautiful piece. Beautiful!!! Love the sketches. Your color choices are fantastic and you have such an artistic eye. We both should do a dance to stop the rain. I’m in the middle of a photography class. It’s hard grabbing one ray of sun for a pic. Great sketches. You are so dedicated to do sketching on your lunch hour! Thanks for sharing them. Wish we had some of that rain–we are back in drought status. PJ: Thanks! I agree, reading other blogs motivates us to search our own subjects. There is so much wonderful talent out there! JJ: Oh I hope it dries out for you too! That would be a hard day to shoot pictures! Thanks for the wonderful words about the sketches…it’s much appreciated! Drowsey: Thanks…little turd he is!